Looking for ideas for low fat, high protein snacking options that won't mess up your macros? Using our delicious oak smoked Protein Cheese we've created a delicious low fat recipe that not only tastes amazing, but these scones are also super macro friendly! With just 3.7g of fat and 8.8g of protein these scones are super easy to make and great to take with you to work, or to enjoy on the go. 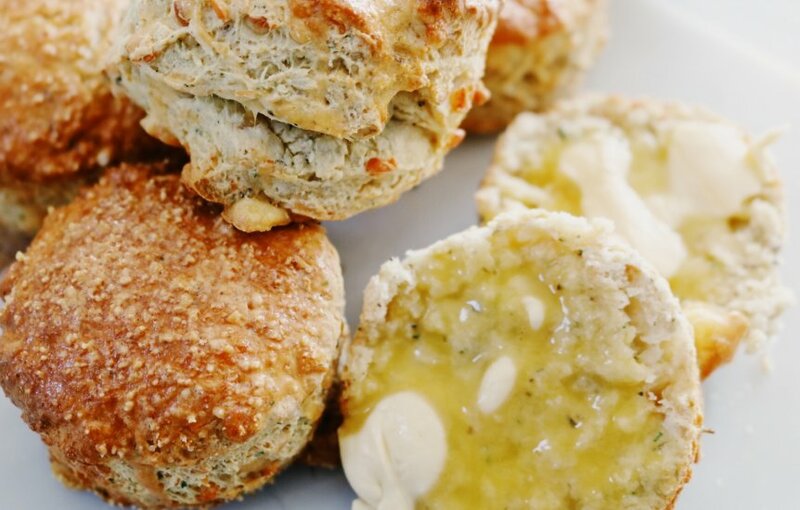 Our Smoked Protein Cheese is perfect for this recipe, naturally smoked over oak shavings for 15 hours, the deliciously sweet and smoky flavour of these scones will have you coming back for more! For that extra hit of flavour and protein, we've added our Smoked Shaker Cheese to the tops too, because who doesn't love more cheese?! Low Fat Margarine - We've switched full fat butter for a low fat margarine, for a lighter texture...and lighter nutritionals too! Eatlean Shaker Protein Cheese - We opted for our Smoked Shaker Cheese instead of parmesan for a delicious flavour hit, without the unnecessary calories and fat content. Heat your oven up to 200 whilst you prep your scone mixture. In a bowl sift in the flour, salt & baking powder. Add in your margarine and rub the mixture together until you get a crumb like consistency. Add in your smoked cheese, your mixed herbs, and your mustard powder and mix well. Make a well in the centre of the bowl and slowly add in your skimmed milk, mixing well and then transfer the dough onto a floured board and continue to knead. Roll out the dough to about a 2cm thickness and then use a cutter to shape your scones, popping them onto the baking tray lined with greaseproof paper. Glaze the tops with a little skimmed milk and an extra grating of smoked cheese then pop them into the oven for 10-15 minutes until golden. Try and allow them to cool before eating…but that’s the hard bit!